Proven strategies and the latest selling tips from eBay's most elite merchants. With an estimated 200,000 people making a full-time living selling goods on eBay, and millions more earning a part-time income, it's clear that eBay can create some impressive profits for those who know what they're doing. 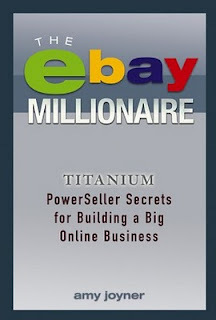 The eBay Millionaire profiles 25 of eBay's elite Titanium Power Sellers-those who move more than $150,000 in goods every month-and reveals the secrets to their success. Author Amy Joyner reveals the fifty top lessons for profitably selling almost anything on eBay, from how to select the best mix of merchandise, ship goods, and keep customers happy to working with wholesalers, making the leap from part-time to full-time selling, and looking like a million-dollar business even if you're working from your kitchen table. Amy Joyner (Greensboro, NC) is an award-winning reporter for the News & Record in Greensboro, North Carolina, who has been covering e-commerce and entrepreneurship for many years. She is the coauthor of Making Dough (0-471-43209-1) and has won awards for her writing from the Associated Press, North Carolina Press Association, and other organizations, as well as three Knight Center Fellowships for business, aviation security, and military reporting.